In emerging markets, more women launch businesses out of necessity than men1 but it’s an eye for opportunity and optimism which fuel their entrepreneurial spirit. In 2005, Katherine Murillo decided to put her technical degree in business administration to work in Costa Rica. She launched a company selling promotional goods such as t-shirts to corporates. Over time, and with the support of her sister, her vision became a reality. She was able to hire two employees to manage graphic design and business operations, and eventually won contracts with one of the largest subsidiaries of FIFCO, the Costa Rica-based food, beverage, hotel and real estate conglomerate. All entrepreneurs face difficulties, but women cope with particular challenges including lack of access to start-up funding and title to assets, making it difficult to provide the collateral banks require. Gaps in their training and skills, and negative attitudes about women venturing beyond their traditional roles in society are additional obstacles women face in accessing finance. In Katherine’s case, it was serious illness that threatened the future of her business. Despite her company’s steady growth, in 2010 the business was threatened by Katherine’s cancer. In the absence of insurance or government income support, when business activity slowed, income deteriorated, and her weaker credit rating made it impossible to seek financing from the local banks. With the help of a line of credit facilitated by Advance Global Capital to a local factoring partner in Costa Rica, Katherine was able to convert her invoices into cash and reinvest in the growth of her business. She began selling her FIFCO invoices at a discount to the local factor and received cash immediately. The factor collected full payment from FIFCO when the invoices came due. As her revenues grew, Katherine’s company went on to win business from all the FIFCO subsidiaries, enabling her to hire more local employees and generate more tax revenue to support the local community. By strengthening this flexible, inclusive, alternative to bank financing, Advance Global Capital and its local factor partner are contributing to a virtuous circle of growth and development. But the benefits go further thanks to the generosity of this woman entrepreneur. 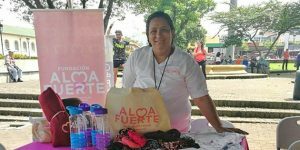 In 2016, Katherine founded the charity Alma Fuerte in support of cancer patients in Costa Rica. Katherine Murillo is further proof that when SMEs are given access to finance, they can strengthen both the local economy and their community. Now that’s something worth promoting.